I was recently on a flight from Atlanta (ATL) to Newark (EWR), and as I was settling into my seat, I couldn’t help but smile and engage with the cheery three-month old baby who was seated in the row in front of me. While I was super shocked that this woman had turned around to apologize for her traveling baby in the first place, what really struck a chord was that she felt like it was her obligation to pacify strangers just because her baby was sharing air space with us. This silly idea that we must apologize for traveling with children is slowly becoming the norm. I blame the strange trend of parents insisting on passing out “in-flight goodie bags” that’s taken the internet by storm lately — it’s a ridiculous practice and it needs to stop. As a mom of two, I always encourage people to travel with their children, and I don’t feel sorry for bringing them out in public — you know, into the real world — and that includes flying. Because newsflash: babies and children are pivotal to society. And it’s time for everyone to get over it and accept that children share the planet with us, too. I feel like I need to take a step back and look at the bigger picture here. Let’s face it, America is one of the most un-family-friendly countries in the world. Compared to Scandinavian countries like Sweden, where family life is actively promoted and encouraged, the US just doesn’t seem to be as kid-friendly — just look at the length of maternity leave we get here, for instance. Here, it’s somehow become a glorified idea to keep our little ones sheltered at home and tucked away from public places as often and as long as possible. I can’t even tell you how many times people have asked me why I would take my children here or there if I didn’t have to. The real problem in American culture today is the notion that children are a burden to society. Too many parents are becoming embarrassed by their babies and toddlers’ normal behavior, with many of them afraid of offending people when they’re out with their kids. The big question is, should parents have to apologize for flying with their children? Of course there will always be varying opinions. It’s a sensitive issue because every family may need or want to travel together, but it’s also the airline’s responsibility to ensure that every passenger has a comfortable in-flight experience. This is where parenting comes into play. In my experience, most decent parents will do whatever they can to make sure their young children are behaving on the plane — believe me, as soon as mine start acting up, I want it to stop instantaneously, especially considering their crying is usually happening about two inches from my ear. 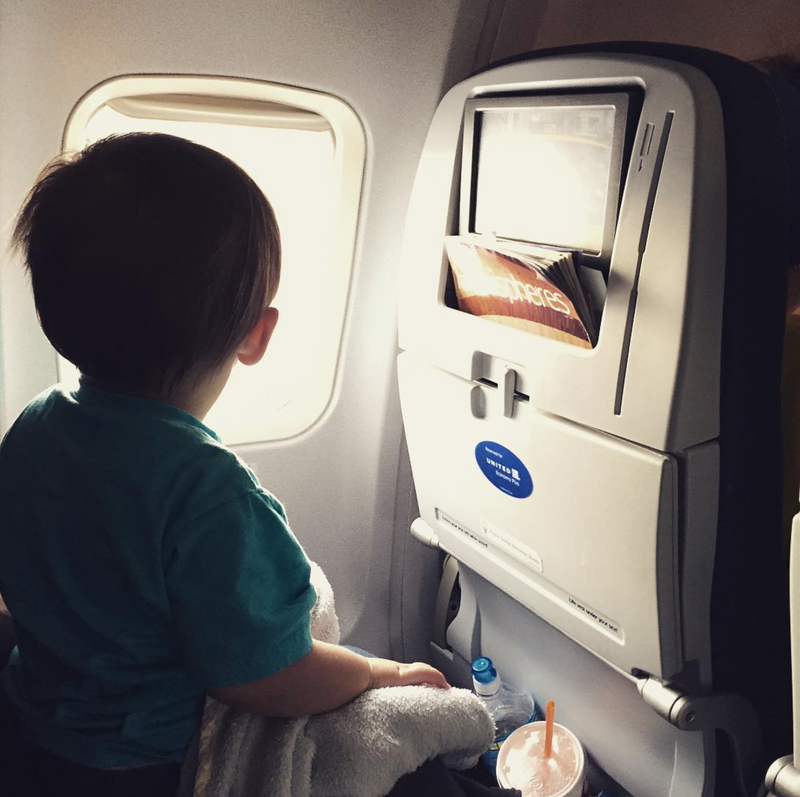 As a parent, I do my part to be 110% prepared whenever I fly with my little ones. I pack a ton of snacks, I show up with an entire screen’s worth of toddler-friendly apps on my iPhone and I make sure I show them the right way to behave through my own words and actions. It is my duty to take full responsibility for my children whether we’re on the ground or up in the air — and in public, in general. At the end of the day, we’re all up in the sky together, so let’s continue to show respect and just be courteous toward one another — tolerance and a positive attitude will get you a long way in life. By the way, why do we feel the need to give out treats and receive rewards for the “inconvenience” of being seated next to a child? I don’t remember the last time I was given a chocolate bar for sitting next to a poorly-behaved passenger — or the man who decided to order four glasses of tomato juice when he’d already been passing gas for several hours. Or the bouts of #flyingfeet I’ve encountered throughout my travels. In all seriousness though, let’s just just keep flying fun and learn to be more kind and considerate of one another, especially when we’re spending so much time in such close quarters. While the idea of handing out an in-flight “goodie bag” to your fellow passengers containing ear plugs and candy is certainly a nice gesture that shows you’re thinking of those seated around you, I think it’s wrong to preemptively apologize for having a child with you on a flight — or anywhere, really. Oh and by the way, the baby on the Atlanta flight I mentioned earlier was a wonderful little traveler — no one heard a peep from her, and I know her mom was more than relieved by the time we landed. As we deplaned, I smiled and said my goodbyes… but not before asking the flight attendant to pass along a pair of wings to the pretty little girl. I hope that family continues to travel together in the future. Have you traveled with small children? Please feel free to share some of your insights, below. Featured image courtesy of Elisabeth Schmitt via Getty Images.